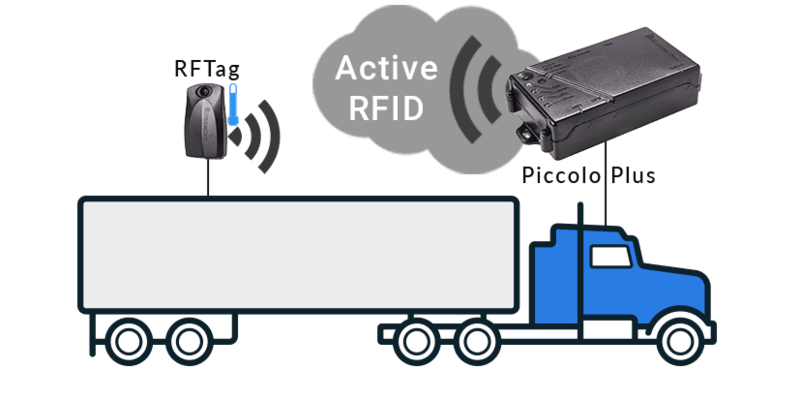 To ensure cold-chain traceability in your refrigerated trucks and assets, we offer an Active RFID solution integrated with GPS tracking, temperature sensors and telematics. Linked with our Piccolo Plus GPS telematics units installed on the cabin of the truck and acting as an RF gateway, the active RFID reader collects temperature data in real-time from the wired or wireless RFID temperature sensors placed inside refrigerated trailers and in various compartments. 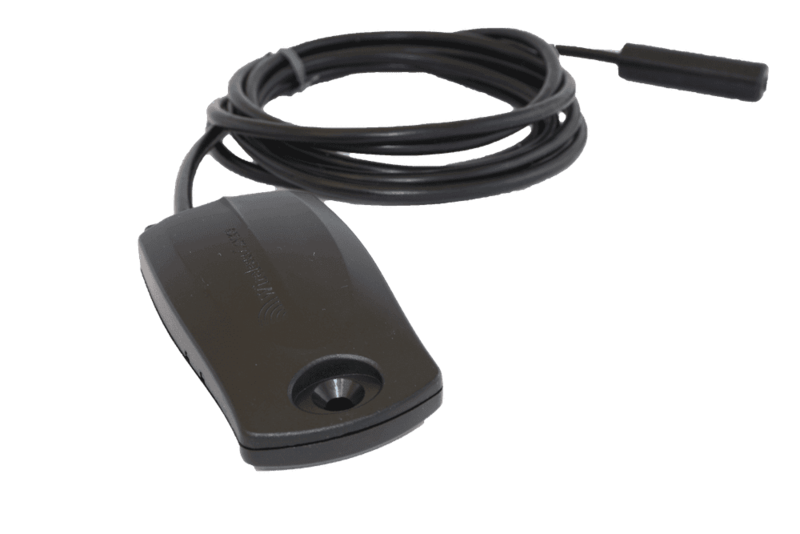 The Piccolo Plus unit sends GPS tracking data as well as driver behavior and engine diagnostics to the platform. We also offer a driver app that allows your driver to view in real-time of in-transit temperature sensitive deliveries. The small size of our sensors, along with their easy plug & play installation, ease-of-use, and very long battery life, bring real value and a high level of flexibility for deploying automated cold-chain management solutions. We help you gain 24/7 visibility & control into the location and temperature status throughout your cold chain , while reducing operational costs & cutting the risk of cargo loss and asset damage. Comprised of small, battery powered RFTags. Integrated temperature sensor with accuracy of +/- 1.8°F (1°C). Easy plug & play installation as all you need to do is mount the tags. Simply place the RFTags on your high value refrigerated assets and start monitoring. A Piccolo Plus GPS telematics unit with an RFLink module is installed via plug and play to the ECM in any truck for GPS tracking, engine diagnostics and driver behavior. High-accuracy temperature monitoring of +/- 0.9°F (0.5°C) when packaged with an external digital temp sensor. Place the RFTag and bring in the wired temperature sensor to the desired area. Wired temperature sensor is around 1m or 3ft long. 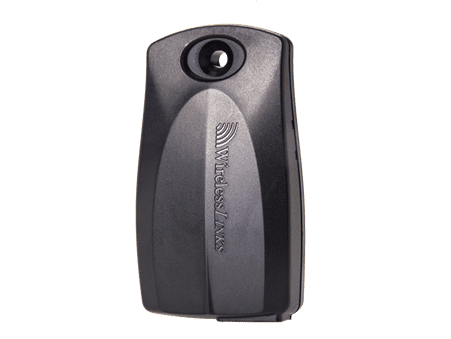 Increased flexibility in terms of installation – allows you to place the RFTag in the best location in terms of reception quality and place the sensor exactly where needed. Super high accuracy temperature sensor. The RFTags communicate via RF at 2.4GHz to the Piccolo Plus Gateway at a radius of up to 250 feet (70m). The Piccolo Plus communicates wirelessly to the RFTags placed on every trailer and receives unique tag ID, signal strength, and temperature data. Each RFTag automatically detects and connects to any number of Piccolo Plus units defined within a system. Increase reliability for your temperature-sensitive product shipments. Go paperless – Easy-to-use cloud based platform provides a visualized dashboard of pick up and drop off. Cloud-based web app that is accessible via computer, tablet, or smartphone. View, monitor and track in real-time the location and temperature status of your refrigerated assets and quickly see your entire asset inventory. Know when an asset was picked up and where it was dropped off and by whom. Remove the need for manual record keeping by creating a unified, automated temperature logbook. Keep records of leased equipment and generate customer invoicing information based on actual usage. Ready to see how you can increase the reliability of your temperature-sensitive product shipments?